This author debated with himself regarding an appropriate title for this article. On the one hand, he considered titling it, “Missed Blessings,” finally concluding the title is too negative. “Why Naaman was Healed” seemed more appropriate, since this title is inclusive of the article’s entire theme; so “Why Naaman Was Healed” it is. The story of Naaman, is paradoxical - both uplifting and grim; uplifting in the miraculous healing of Naaman; grim in the punishment of a man named, “Gahazi, an account this author shall reserve for another article.” Before proceeding further, read the entire account found 2nd Kings 5:1-27. When visiting his hometown of Nazareth “where he had been brought up,” Jesus incurred the wrath of the people in the synagogue by stating that many persons suffered from leprosy in Israel during the ministry of the prophet Elisha, “yet not one of them was healed, but only Naaman the Syrian” (Good news Bible). The Lord’s statement begs the question: Why was Naaman healed; why was he, a Syrian, healed when all the lepers in Israel received no healing from God? What a sad read that last phrase is: “but he was a leper.” Here was a man who had it all: fame, wealth, national eminence, the soaring esteem of his king and nation. But he also had leprosy, an incurable, deadly disease. Undoubtedly, only his high rank kept Naaman from being banished and ostracized from the rest of society, as were lepers less prominent than he. One day, the anonymous, courageous Israelite girl, exhibiting a compassion for her capturers not often displayed by God’s people, said to Naaman’s wife - to whom she had been assigned as a slave - “I wish that my master could go to the prophet who lives in Samaria. He would cure him of his disease.” A person of spirituality and pious trust in God in the face of adversity, this small girl displayed a compassion for her captors often lacking today in the people of God. She had every human reason for bitterness and hatred; she had been separated from her parents and family, she had been torn from all her relatives, friends and acquaintances. She had been sent into slavery in a strange land, and she faced an uncertain future. Therefore, judging by human standards, who could fault the girl if she detested the Syrian household to which she had been assigned? However, such was not her attitude. Believers in the Church age, known as “The Dispensation of Grace,” consider themselves a generation of faith – people who have bestowed on them a special gift of faith. This is true, in that God’s people are not under the legality of the Old Testament dispensation; nonetheless, in contemplating the lives of persons in Old Testament times we note that many of them also manifested great faith; they demonstrated a trust in God that often underscores the weak faith of many believers of our generation. Such was the case with this captive little girl; this anonymous, captive little hero of faith! It was through her compassion for the one who enslaved her, and her unswerving trust in the God of Israel that Naaman was brought in contact with the Lord’s healing power. Refusing to succumb to her bitter circumstances she became, rather, the initiator of her master’s deliverance from leprosy. At times, the enemy of our soul utilizes bitter circumstances as weapons to discouraged us in our Christian pilgrimage. At such times we may question God, and even fault Him for our difficult circumstances. And, if we do not call Him into question, we sometimes permit ourselves to be afflicted with a burden of self-condemnation. Yet, all the while, God is in control. He is governing the circumstances. There is a chorus that goes, “Through it all/ Through it all/ I learned to trust in Jesus/ I learned to trust in God/ Through it all/ Through it all/ I learned to depend upon the Lord.” Yes, we sing about it. We realize that such reliance on God is possible. But have we imbibed the actuality of it? Faith is a spiritual muscle. It must be toned up by spiritual exercise. Faith operates in the realm of the impossible. When circumstances enter the area of human impossibility, where there is no answer to our problems – that is the realm in which faith operates. Faith operates in t! he realm of the invisible, the impossible, the unfelt, and the hopeless. This is the spiritual, operable territory of faith. If believers never are placed in situations where faith must be exercised, faith will die, just as an unused muscle of the body withers away. Resistance is a necessary ingredient to exercise. Muscles strengthen by placing resistance against them. Notwithstanding her cheerless circumstances, General Naaman’s little slave girl - who did not have the spiritual enlightenment we claim to have in our times - did not permit her faith in God to fail. There are various worldly schools of thought regarding the treatment of enemies. Perhaps the reader has heard them. One is: “Do it to them before they do it to you. They’re going to take advantage of you anyway, so you had better do it to them first.” But that must not be the Christian’s philosophy. Then there is the school of passive resistance: This was the philosophy of Gandhi. Overcome your enemy with passive resistance. Though non-violent in type, this still is not the Christian’s philosophy of how we must treat out enemies. There also is the violent philosophy of the terrorist: Destroy as many as possible of those who disagree with you. Show them no mercy, have no compassion for them. Destroy them, and heaven shall reward you. And then, there is the sacred philosophy of the Lord Jesus Christ: That of active love. Love your enemy. Do good to them that hate you. As people of God, believers are not to passively resist our enemies; we are to actively love them. And that is what this little girl was doing – loving those who had misused her. Naaman also was healed because God is no respecter of persons. At times, this is a truth difficult of believer to really accept. Nonetheless, 2nd Chronicles 19:7 states three important facts relating to God. 1. “Wherefore now, let the fear of the Lord be upon you. Take heed and do it. For there is no iniquity with the Lord, our God.” So, there is no evil with God. There is no sin in Him. 2. “There is no respect of persons with the Lord.” As children of God, we all are equal before Him. We all are equal beneficiaries of His blessings. 3. “And there is no taking of gifts with the Lord.” We cannot bribe God to give us His blessings. Sadly, believers sometimes do attempt to bribe God in order to receive what they want from Him. Some years ago, a newly saved young couple who attended one of my home Bible studies, but did not attend my church, decided to open a barroom. Nothing I said could persuade them that a barroom was no business for a Christian. I simply could not get through to them in that matter. They told me, “Pastor, we’re going to run our barroom like a Christian business. We’re going to give a large percentage of our profits to the Lord’s work, and use the back room for prayer meetings.” In my estimate, they were attempting to bribe God to bless their sinful enterprise. God is so poor that He needed their ill-gotten gains. If they “paid Him off,” He would bless their business. It did not work out that way; after a couple of months the business went bankrupt and it closed. How often, to a lesser degree, do others try to do this with God? They try to bribe Him to bless them, when all along all that is necessary is to conform to God’s way of doing things. His blessings are open to us as we meet His conditions to receive them. “Then he went down, and dipped himself seven times in Jordan. According to the saying of the man of God: and his flesh came like the flesh of a little child, and he was clean” (Verses 10-14). As with Naaman, there are situations in which God must deal with our preconceived ideas of how He should resolve matters. He must get rid of the “I thought” from our minds in order to bless us. If the General Naaman had refused to surrender these two words, he would never have been healed. Their surrender was indispensable to his healing. Ridding ourselves of our preconceived notions of how God should bless us is essential to our receiving from Him, as well. There are many “Naamans” among God’s people in the Church. As did the general of Syria, they expect the spectacular when seeking a blessing. They want the fire to fall, the lightning to flash and the thunder to roll. Yet, all God asks us to do is be obedient to His Word - to do things His way. Among the most important things God want done His way in the matter of salvation. He has made it so simple that a young child can understand it; nevertheless, some choose to make it extremely difficult. 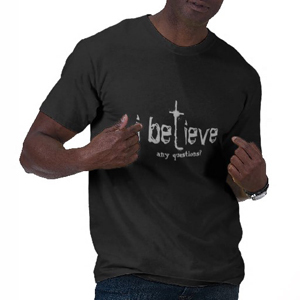 God Word tells us to simply, “Believe on the Lord Jesus Christ and thou shalt be saved.” That’s it; merely believe in Him! However that is too unproblematic for some people, so they add non-Biblical demands. They make laborious what God has made effortless. Doing things God’s way applies to every aspect of our walk with Him. Only as we do so, shall we be enabled to have the simple, sincere faith evidenced by that little slave girl; that God-loving little girl who was instrumental in advising a great military general in finding his healing, after he discovered that God’s blessings are not difficult to receive, as long as they come to us His way.